Customer Reviews For "Seagrass Pier (Unabridged, MP3) (#03 in Hope Beach Audio Series)"
A gripping novel about a heart transplant patient who recals her donors thoughts and memories about the crime that took her life. It appeared to be an unbelievable premise, but I found myself being immersed in the story and excellent portrayal of the main character allowed this unbelievable idea to seem realistic. The narration was excellent and only enhanced the story, not taking anything away from the story. Excellent read for those who love some suspense and action in their fiction. Colleen Coble is a top rate author. A thoroughly enjoyable book and intriguing twists. Includes deception and lots of romance. 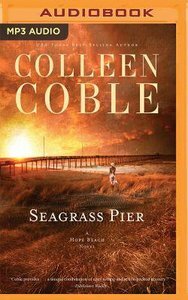 I've read several books by Colleen Coble, both contemporary and historical. I personally prefer her contemporary novels, and Seagrass Pier is excellent. At first I thought the plot was going to be like Double Blind by Brandilyn Collins, but Seagrass Pier was quite different (although it came close to Brandilynn's trademark "Seatbelt Suspense", in that it was full of tension and hard to put down). Nick, Elin and the supporting characters are all well developed and believable, and the plot is a tightly-woven web of suspense with a little romance added in. Seagrass Pier is Christian fiction and while Christian values underpin the lives of all the main characters, it's not preachy fiction. My one concern is that I never saw Elin accept God's forgiveness for her sin. In real life, God forgives us before we even ask, yet even at the end, Elin doesn't seem to understand she is forgiven. This is the third book in the Hope Beach series, following Tidewater Inn and Rosemary Cottage. However, it can easily be read as a standalone title (I have read the previous two books-while all three books have the same location, they focus on different characters with only a few cameo appearances from the earlier books). Recommended for fans romantic suspense. Thanks to Bethany House, Litfuse Publicity, and NetGalley for providing a free ebook for review. Order now to secure your copy when our stock arrives. Other edition is available. 9781595547828 0 Available. Expected to ship in 6 to 7 weeks from Australia. Order now to secure your copy when our stock arrives. Other edition is available. 9781531877361 0 Available. Expected to ship in 5 to 6 weeks from Australia. Order now to secure your copy when our stock arrives. Other edition is available. 9781491545676 0 Available. Expected to ship in 6 to 7 weeks from Australia.